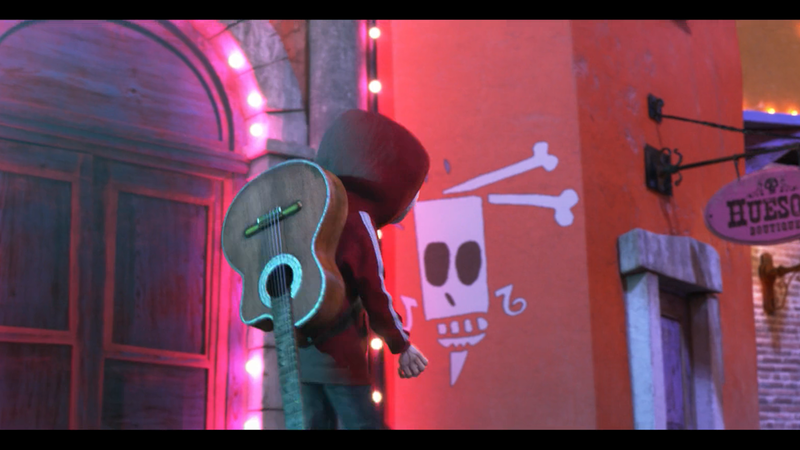 I saw yesterday the lovely film Coco from Pixar and I think I spotted a Grim Fandango reference. What do you think about? I thought that whole movie was a Grim Fandango reference (plus The Corpse Bride). It was a very nice story though. Although I would be surprised if Grim Fandango never came up during production, it would be difficult to not look similar when both are based on the style and meaning of "The day of the dead". I think it's not an easter egg, if you mean the painting? Sorry. ManicMatt is right. It's not really a reference to Grim Fandango at all. The living skeletons in both are called Calacas and The Day of the Dead stuff has been a fairly long tradition. The movie Vampires: Los Muertos has a guy who makes and sells skulls. And I highly doubt that it was in any way referencing Grim Fandango. I was also disappointed, and like you I freeze framed on that scene thinking it might be Manny. There was another character who looked a bit like Hurley though, but probably just coincidence. Grim Fandango was simply inspired by the same thing that Coco was. It would make sense that the two would share imagery. I don't think that's a Grim Fandango reference. Although this film should have had a Grim Fandango reference. I'm still slightly sad that there isn't one. References are just getting boring. Overused and lazy way to get cheap thrills from people who remember back when original characters became iconic on their own merits. When was the last time movies created a new iconic character at the level of Indiana Jones or Doc Brown?! Movie studios these days only want to invest in low-risk established characters that they know the audience will go and watch. I'm done! The least fun I could ever imagine is watching a different actor play Han Solo. I don't suppose you'll accept the Marvel characters (Wolverine, Magneto, Iron Man, Groot, Deadpool...) as "new iconic characters", even though a lot of viewers are getting to know them for the first time. Same with The Lord of the Rings? But what about Harry Potter or The Hunger Games (Twilight seems to have had less staying power)? Or Lisbeth Salander from the The Girl with the Dragon Tattoo? Sure, they were adaptations, but adaptations of new books, with characters not already known to previous generations. ... Or hey! Jack Sparrow. You gotta grant that one. (OK, so it's from 2003, which is already 15 years ago. Man, time flies!) And Elsa and Anna from Frozen. That was 2015 2013, so not that long ago. So, yeah, your post kinda supports what I was saying. The three you named at the start are from decades-old movies. Tyler Durden was originally from a best-selling book so no real risk taken there either. The Marvel characters are already established and even if only the fans went to the movies the studios would turn a profit. Again, low-risk. Lord Of The Rings? You mean the book voted the best novel of the 20th century? The other book-series adaptations you mentioned were all best-sellers before they became movies. So all low-risk, high-potential-profit characters. And Elsa and Anna? Are they really iconic characters or just characters in a hit film? I mean, I'd be pretty surprised to see them on any adult's top ten favorite characters list. Nice one, but John Wick was a very low budget, almost indie, film, and it became a surprise hit for the studio that backed it. Keanu did it for only $1 million, the same amount The Big Bang Theory actors get for a single episode. No real risk taken there by the studio if it had flopped. Well, I haven't seen Django Unchained (not a fan of westerns), so I'm not sure how similar the character is to the 1966 spaghetti western called Django. Wikipedia says the character has appeared in 31 movies, official and unofficial. Don Draper was from Mad Men (which I've also never seen), a tv series. So Mandle's point still seems to be mostly holding up. And I'd argue against Jack Sparrow being quite as iconic of a character as ones from the 80s and 90s. Is anyone over 10 in any way excited about the newer Pirates movies? Do people still quote lines from any of the movies? "If this was a dream there would be rum." "this will be the day you almost caught Jack Sparrow!" And people still dress up like him in halloween. Also, I think we might be a little biased due to our age, as the new movies are the not the ones we grew up with, and additionally it might make time for new movies to live in public culture long enough to become iconic. Yep, Elsa is not there, but there are a few characters from the last decade which did not come from Marvel movies or books. Okay, perhaps I was wrong. I guess he is iconic to some. And it could be my personal feelings about the movies and the fact I haven't seen anyone dressed as him at the local Con. So, yeah, your post kinda supports what I was saying. The three you named at the start are from decades-old movies. Part of the point I was trying to make (and I see that tzachs has brought it up while I was writing) was that it's hard to tell in real-time, particularly as you get older, which characters are going to become pop-culture icons. In 1998, I don't think anyone would have named The Dude as a character that would still be part of pop culture twenty years later. I wouldn't personally rank John Wick as a new icon (he... has a dog and is good at killing people?) – I'd think Liam Neeson in Taken is more iconic (though I have no idea what his character's name is, which isn't a great sign) – but what do I know? Tyler Durden was originally from a best-selling book so no real risk taken there either. I think you're massively overestimating the number of comic book fans. Best-selling comic titles are usually only at about 200k copies, with about 7 million comics sold in total each month. Solo opened to $84 million in its first weekend and is considered a flop. No big-budget movie can rely only on comic book fans or scifi fans and make a profit. I think we're focusing on different things. There have always been lots of movies adapted from books and other source material. Does that mean that characters like James Bond, the Godfather(s), Hannibal Lecter, Inigo Montoya, Holly Golightly, Roy Batty, Jack Torrance, Forrest Gump, Norman Bates, John McClane or Dorothy Gale shouldn't be counted as "new iconic movie characters" back when they first appeared on screen? It gets a bit trickier with recent books that were huge in their own right. Atticus Finch is an iconic movie character, but the book was already a massive hit. Same with Harry Potter. But even if kids of that generation would know Hermione and Voldemort and Dumbledore regardless, do you really think they would come up in a discussion between you and me if not for the movies? I think there is a point to be made that a lot of the more creative, interesting work has shifted over to TV. On the other hand, the TV landscape is so fractured that it's really hard for even great characters to become iconic. Even so, if you said Alan Grant from Jurassic Park was an iconic character, but doesn't count because he's from a book; I would argue that not only did Sam Neil give life to the character, he's also written quite differently in the book - He loves kids! Also, maybe this discussion should get split into a new thread?